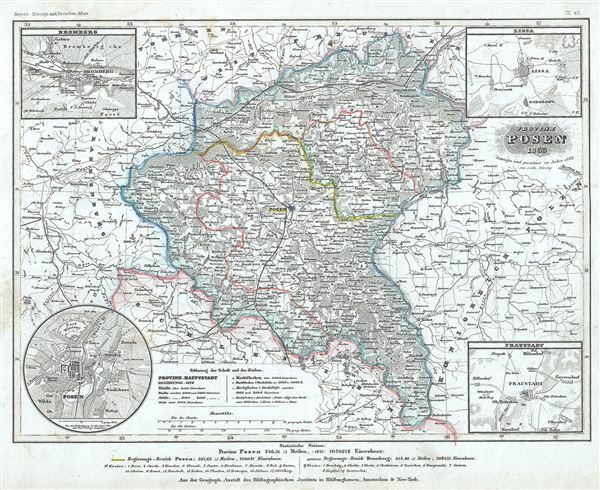 This is an uncommon 1853 map of the Province of Posen by Joseph Meyer. It covers the province, part of the Prussia and later part of the German Empire, noting important towns, cities, rivers, railways and other topographical features. Four insets are included detailing the city plans of Bromberg (Bydgoszcz), Lissa (Leszno), Fraustadt (Wschowa) and Posen (Poznan). Following the Greater Poland Uprising of 1848 against Prussian forces, the Grand Duchy of Posen became the Province of Posen, a common Prussian Province, and was incorporated into the German Confederation. It would later be incorporated into the German Empire following the Franco-Prussian War of 1871 and the unification of Germany. This map was issued as plate no. 40 in Meyer's Zeitung Atlas. Although all the maps in this atlas are not individually dated, the title page and maps were often updated while the imprint with the date was not, causing confusion to the exact date for some of the maps. Moreover some maps in the atlas were taped in at a later date as an update to the atlas. We have dated the maps in this collection to the best of our ability. Very good. Minor toning and spotting at places. Dampstains over top and bottom margin.